Preparing for Thanksgiving is stressful, not only do you want the food to be amazing but you want your home to be perfect as well. We have come up with 5 Thanksgiving Tablescape Tips that will have your table looking like… well… MOD Interiors set it up personally for you. Follow these tips and you are sure to have a stunning table setting. Don’t be afraid to use your natural resources….. The most beautiful things in life come from nature. 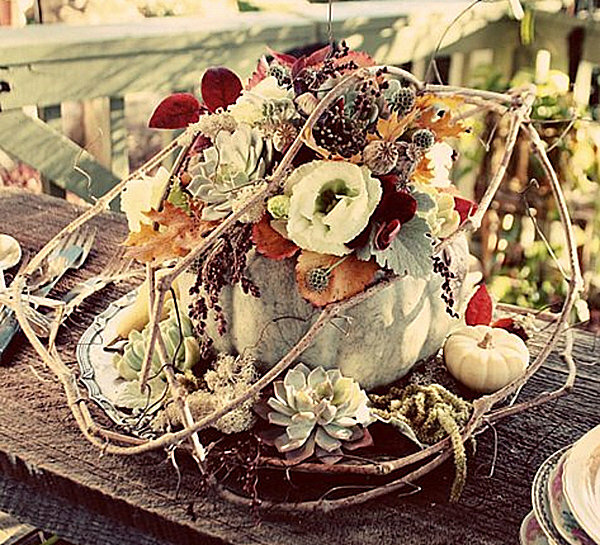 The center piece can make or break a beautiful tablescape!!! 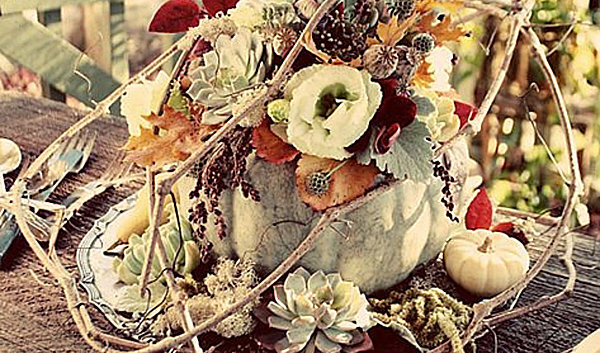 This gorgeous eye catcher uses a blue pumpkin over filled with foliage, ivy, succulents, floral blooms and moss to create a organic mood. Thanksgiving dinner is meant to be enjoyed in a warm, welcoming atmosphere. Nothing says welcome like mood lighting…. 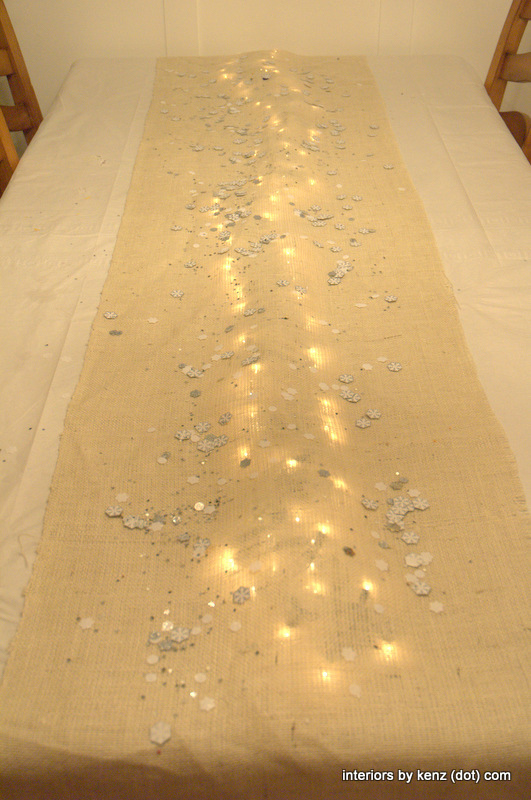 By placing a strand of lights under a burlap table runner, you create excitement and movement. It will take a little finagling to them arrange them perfectly around your delicious platters of thanksgiving yummiest, but all good things require work. Trust us on this one…. Lighting is everything! If there was ever an opportunity to personalize thanksgiving dinner, place settings are it. Each setting can be customized with family china and silverware, perhaps even small family mementos in the center. No two place setting have to be the same. The key to layering the china is contrasting similarities, whether it be through color, shapes, or patterns. For example: the white charger in the picture above has an exciting shape, which is then contrasted with a green round plate with a detail pattern that resembles the movement of the charger. 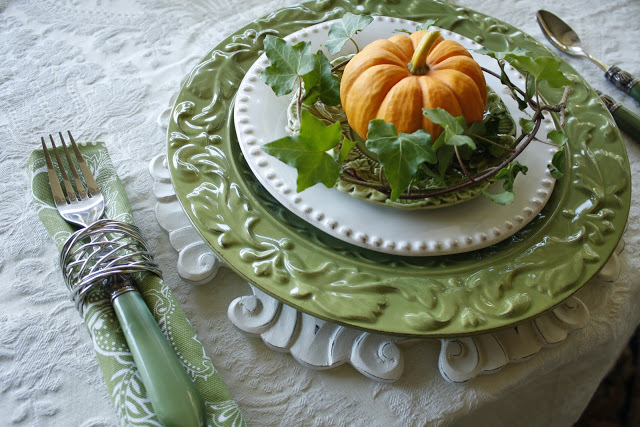 A smaller simpler white plate almost creates a interior boarder which is then topped with a small green place with a similar patter to the larger one. 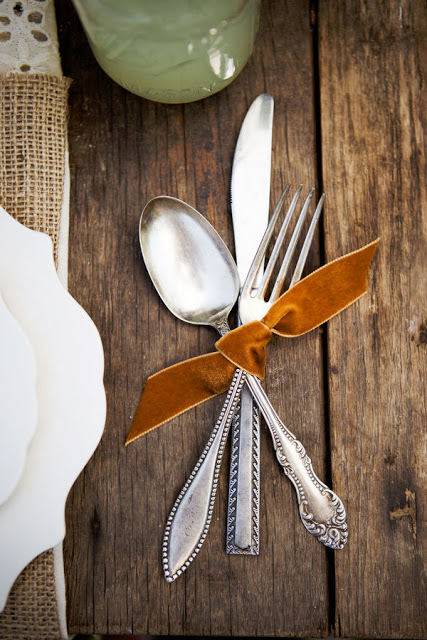 A beauty ribbon can be used to tie together the silverware. This is a great way to pull a bold color from your floral center piece. This is one of our favorite finishing touches, it really brings the tablescape full circle. 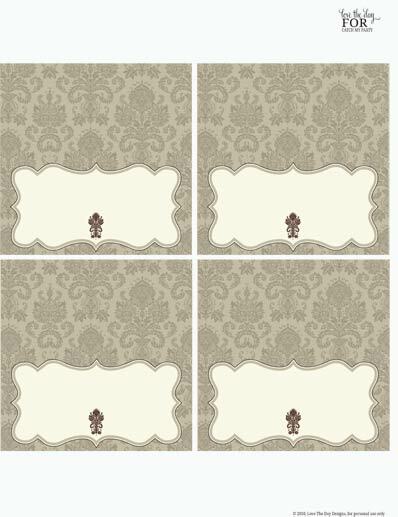 Finally and probably the most customizable features of a successful tablescape is the place cards. There are endless possibilities. Make sure that the theme is coupled with at least one other aspect of your table… but not too matchy matchy. Also have fun when writing someone’s name… try using nicknames or little catch phrases between the family… it’s a great way to get a conversation started or reminisce.